This tour to Rajasthan combines the world famous Bharatpur, with its huge numbers of wintering birds, with the spectacular Ranthambhore reserve, home to a completely different avifauna and Tigers! Birds we hope to see include Indian Courser, Sarus Crane, Indian Skimmer, Indian Vulture and Tickell’s Blue Flycatcher. We will also visit the Taj Mahal, the Red Fort in Agra, Jaipur, and take a boat trip on the Chambal River. Day 1 Overnight flight to Delhi. Day 2 Arrive in Delhi and transfer to the Bagh Hotel in Bharatpur for a five-night stay. En route we will see our first common Indian birds which may include Black (Black-eared) Kite, Common and Bank Mynas, Black Drongo, Laughing Dove, Pied Bushchat, Indian Robin, Little Swift and Rose-ringed Parakeet. Days 3–6 Bharatpur is justifiably world famous for its wildlife. It was once the preserve of the Maharajas for hunting and, ironically, this is the reason that it has survived in such pristine condition. It is possible to see over 100 bird species in a day using cycle-rickshaw or on foot. As we arrive early in the morning we should see hordes of Bar-headed and Greylag Geese flying in to feed alongside Sarus Cranes. If Siberian Cranes have returned we will make a special effort to locate them. There are many walks to follow around the 'Bounds' and the habitat varies from shallow lakes to flooded forest and dry savannah. Storks are particularly conspicuous and we should see Asian Openbill and Black-necked, Painted and Woolly-necked Storks, whilst other fish-eaters include Little and Indian Cormorants, Oriental Darter, Black-headed Ibis and Black Bittern. Ducks are numerous and may include Lesser Whistling-duck, Knob-billed, Ferruginous and Indian Spot-billed Ducks, Red-crested Pochard, Cotton Pygmy-goose and Ruddy Shelduck. 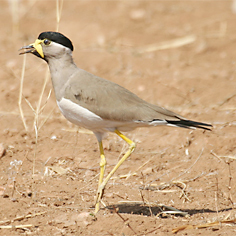 Other water-dependent birds commonly found include Bronze-winged and Pheasant-tailed Jacanas, Grey-headed Swamphen and White-breasted Waterhen. Waders are plentiful and, as well as the common Palearctic migrants, we may see White-tailed, Red-wattled and Yellow-wattled Lapwings, Indian Courser and, with luck, Sociable Lapwing. There are also plenty of landbirds, which may include Orange-headed Thrush, Greenish, Hume's, Smoky and Yellow-browed Warblers, Brooks's Leaf Warbler, Small Minivet, Common Woodshrike, Brahminy Starling, the virtually endemic White-tailed Iora, Bluethroat and the spectacular Siberian Rubythroat. Grey Francolins are commonly heard and are relatively easy to see, but Black Francolins are much more difficult. Birds of prey are numerous and omnipresent. Up to ten species of eagle including Crested Serpent-eagle, and Bonelli's, Imperial, Greater Spotted, Indian Spotted, Steppe and Tawny Eagles, while the most regular vulture is now Red-headed Vulture. Most species of owl and nightjar can be seen at their daytime roosts and target species include Dusky Eagle-owl, Indian Scops-owl, Brown Boobook, Spotted Owlet and Large-tailed Nightjar. Another day we will visit Bund Barita, one of the few reliable spots in the area for Indian Skimmer. The reservoir holds huge numbers of wildfowl and other waterbirds and we may also see Black-bellied, River and Whiskered Terns. At an old hunting lodge nearby we will look for Barred Buttonquail, Sulphur-bellied Warbler and Indian Chat, whilst at a nearby government house we will look at the large colony of Indian Flying-foxes. On the way back we will stop at a breeding colony of Long-billed Vultures, a very rare bird in India these days. At the end of our stay at Bharatpur we should have seen over 200 species together with a few mammals including Nilgai, Sambar and Spotted Deer and Golden-backed Jackal. Day 7 Today we will leave Bharatpur and transfer to Chambal for a two-night stay. En route however, we will visit both the spectacular Taj Mahal and the Red Fort in Agra. Nearby, on the River Yamuna, we will look for River Lapwing and Pallas's Gull, whilst at the fort we may see Dusky Crag-martin. Day 8 We will spend all day around the Chambal River area including taking a relaxing and bird-filled boat trip on the river. This will give us the opportunity to get good close views of Black-bellied and River Terns and Indian Skimmers and many other waterside birds including Great Thick-knee and Sand Lark. Additionally, we should see both of the Indian sub-continent's crocodiles, Muggar and Gharial, and there is the possibility of seeing the endangered Ganges River Dolphin. Day 9 The morning will be spent around the Chambal River area again. After lunch we will drive to Mathura where we will catch a late afternoon train to Ranthambhore. Travelling by Indian railway will be an experience in itself although we will enjoy the comforts of first class air-conditioned compartments. Ranthambhore is another former hunting preserve, especially for Tigers, of the Maharajas of Jaipur. We have a good chance of seeing a Tiger during our stay, and may even glimpse a Leopard or Sloth Bear. This is a spectacular reserve comprising deep ravines and steep cliffs with thorn and dry deciduous forests, all overlooked by an impressive 11th-century fortress. We will make a series of morning and afternoon visits to the reserve in either canters (22-seat open trucks) or gypsies (6-seat open jeeps). Three nights in Ranthambhore. Days 10–11 The different habitat at Ranthambhore ensures that we will see plenty of new species. These may include Indian Peafowl, Painted Spurfowl, Jungle Bushquail, Alexandrine and Plum-headed Parakeets, Stork-billed Kingfisher, Common Hawk-cuckoo, Yellow-footed Pigeon, Ashy-crowned Sparrow-lark, Rufous-tailed Lark, Bay-backed Shrike, White-bellied Drongo, Large Cuckooshrike, Rufous Treepie, Tickell's Blue Flycatcher, Asian Paradise-flycatchers, Indian Roller, Indian Grey Hornbill and Greater Coucal. Birds of prey are again present in good numbers and may include Oriental Honey-buzzard, White-eyed Buzzard, White-backed Vulture and Black Eagle whilst Shikras sit inconspicuously close to the tracks. We may find a roosting Brown Fish-owl here and will also make an effort to see Savanna Nightjar one evening. Nearby are some lakes and arid areas and here we may find Chestnut-bellied and Painted Sandgrouse. Day 12 Leaving Ranthambhor, we will return to Delhi via Jaipur, birdwatching en route. We will make a brief city tour of Jaipur after taking lunch in the city. Finally arriving back in Delhi, we will have shared accommodation available to us for a wash, change (private rooms available at extra cost) and dinner. Day 13 Early morning transfer to the airport to catch our flight with a late morning arrival in London at the end of the tour. General Information Days are warm but early mornings and late evenings can be cold. Rain is unlikely. The pace is easy. There are a number of health requirements and you must consult your GP in this respect. Insects are not a major problem at this time of year but you must take precautions to avoid other health risks. Accommodation is in good-standard hotels, all with private facilities. Visas are required. Price includes return scheduled flights between the UK and Delhi, accommodation in twin-bedded rooms, all meals including packed lunches, all transport in India, entrance fees to parks, still camera fees (video cameras are extra) and guiding services throughout. Excluded are insurance, visas, alcoholic drinks, gratuities and items of a purely personal nature.